In this culmination of his widely read and highly acclaimed Cultural Liturgies project, James K. A. Smith examines politics through the lens of liturgy. What if, he asks, citizens are not only thinkers or believers but also lovers? Smith explores how our analysis of political institutions would look different if we viewed them as incubators of love-shaping practices--not merely governing us but forming what we love. How would our political engagement change if we weren't simply looking for permission to express our "views" in the political sphere but actually hoped to shape the ethos of a nation, a state, or a municipality to foster a way of life that bends toward shalom? This book offers a well-rounded public theology as an alternative to contemporary debates about politics. Smith explores the religious nature of politics and the political nature of Christian worship, sketching how the worship of the church propels us to be invested in forging the common good. This book creatively merges theological and philosophical reflection with illustrations from film, novels, and music and includes helpful exposition and contemporary commentary on key figures in political theology. James K. A. Smith (PhD, Villanova University) is professor of philosophy at Calvin College in Grand Rapids, Michigan, where he also holds the Gary and Henrietta Byker Chair in Applied Reformed Theology and Worldview. He is the editor of Comment magazine and is a popular speaker. Smith has authored or edited many books, including Imagining the Kingdom, Who's Afraid of Relativism?, and the Christianity Today Book Award winners You Are What You Love, Desiring the Kingdom, and Who's Afraid of Postmodernism? 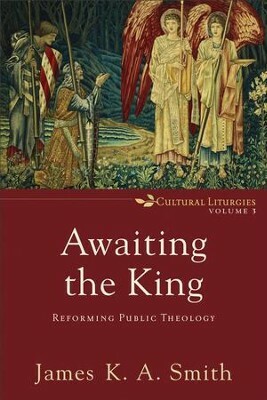 I'm the author/artist and I want to review Awaiting the King (Cultural Liturgies): Reforming Public Theology - eBook.